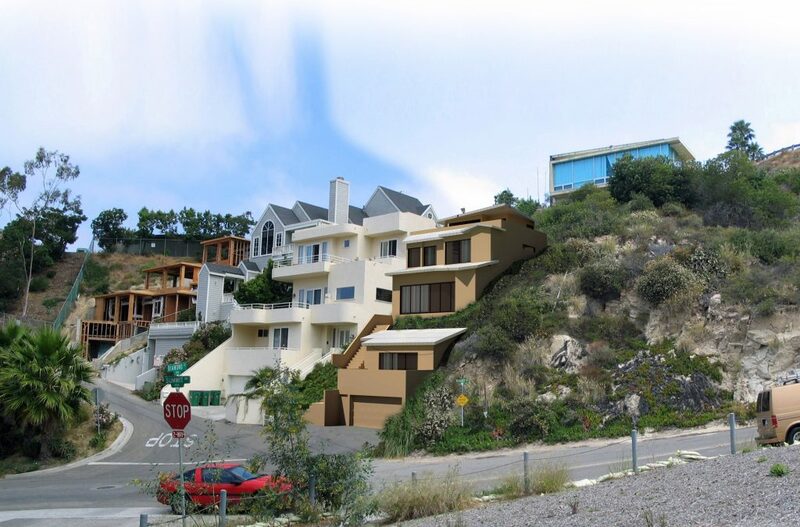 A rendering for a proposed home built on steep Summit Way in Laguna Beach illustrates how the structure could be stepped into the hillside to lessen its massiveness and accommodate the neighbor’s views. Real estate broker Leslie Anvari likes to solve problems and help her clients achieve their dream home. The vice president of TL Group Corporation, a Laguna Hills architectural and engineering firm, and president of Anvari Associates, a land developer, often contends with protests from established residents over potential buyers developing in their neighborhood. Q: What is the cause of the protest? A: Since the beginning of time people have always been protesting change. In this case it’s in their neighborhoods and we understand how they can be worried. Tearing down the old to make way for the new creates concern and controversy, especially if it interferes with a coveted view. Building a modern sleek home design tends to overwhelm a smaller home with the possibility of taking away that view. The view preservation reform (in Laguna Beach) is an indicator of how people wish to maintain them. Every builder has to go through a review board, following rules and regulations before a project can be approved. Unfortunately it doesn’t stop there. Some people feel they have inalienable rights with a “first come, first serve” attitude. Simply because they have been living on the street first, they feel it necessary to threaten prospective buyers with legal action and harass them relentlessly. Q: What have been some of your experiences? A: Just recently when I brought my clients to see an available property, the guy across the street stormed out of his house yelling at me and the prospective buyers. We were standing there and he goes on and on in this rage. He’s not calm, doesn’t greet us, he just starts yelling right off the bat. And this wasn’t the first time. I can understand being upset, but screaming is not an effective way of getting things done and makes a difficult situation even more difficult. Yes, some people have been taken advantage of by architects and builders when they are not shown the right property lines and other shady dealings. But assuming everyone is that way by threatening prospective clients and harassing them before anything is said and done needs to be addressed. As a realtor in Laguna Beach, you can be sure of being harassed. I turn the other cheek to the behavior, but it is not fair to the buyers. Besides, who wants to buy a home with an angry threatening neighbor across the street? Q: What are the repercussions on your end? Do protests create costs for the city or other neighbors? A: Building a custom home in Laguna Beach is extremely expensive and the rules and regulations are very strict. Therefore, when a neighbor complains about your building that is to code and says it is massive or too modern and have people sign petitions agreeing to such, it can stop the project completely. All the funds put towards a new dream home becomes worthless when land sits there empty. There are many vacant lots landowners have been holding on to for years in hopes of finding a buyer or the neighbor who initially complained finally moves or passes away. Or better yet, the neighbor decides to remodel their home and now needs the landowner’s support. Time is money and hiring the professionals needed to get through the design review process is costly. Sometimes there is no negotiation that appeases the complaints so it ends in a stalemate. But what I want to get across is when everyone negotiates you end up with a spectacular project that increases the real estate value in the neighborhood. A: When someone is open to negotiating we normally come to a consensus on both sides. I’ll have to admit, most of the time it won’t be a 50/50 exchange. We try to cooperate as much as we can. We know these are tough issues to address and always do our very best to listen and be open to concerns. But many people are attached to how things have always been, having lived in the area for many years, and this creates a whole new dynamic. They are emotionally charged and unreasonable making it impossible to even talk to them. When I knock on doors to go over the particulars, I get the door slammed in my face. They don’t want to even look at the project, assuming the worst. They need to question, “Is it fair to stop someone else from having a beautiful view just like the one they have been enjoying? Do they have more rights than the new person?” We aren’t saying to just stay quiet. Talk to us. We want people to be just as open to what we want as we are to their wants. Q: Threats and excessive cost might scare away a buyer. What do you suggest? A: Telling clients about the possible situation is the hardest part for sure. But we tell them we have experience on our side. We have done many projects that people have been very vocal against and we found a way through it. We understand the process and requirements the city requires for approval. It is still a business chance. But there are countless ways to work out problems. Unfortunately threatening prospective buyers with legal action even before they have purchased the land comes down to harassment. It’s hard to sell a piece of property if you can’t build on it when threatened with legal battle. Q: What are some ways buyers might be able to work out the problems? A: If you have a possible property on a view corridor, I might suggest mitigating the design and cantilevering the building so it goes down the hillside. Architects can do many things to help a situation. The architects job is to make a design that fits the contours of the property, to negotiate with the hillside not chop it out. Choose a builder that knows how to build in the area. But again, it is discretionary and the solution always depends on the many changes needed in order to get it approved. Every piece of property has its issues and despite it all, it’s what makes the process fun. And the finished process is always a wonderful thing to behold, especially when everyone has come to agreement and is happy. Previous PostFeatured Property Laguna Niguel: Amenities Sweeten a Custom Home Next PostAsk the Expert: Time To Break Your Lease?